With 'Click Book Go' reservations, you can check online for cheap fares, timetable, seat availability and make instant confirmation reservations for bus and coach travel from Twizel on New Zealand's largest national coach transportation network in association with Newmans Coachlines, InterCity Coachlines and Great Sights - with its premier sightseeing services, operating 150 daily services to over 600 towns, cities, skifields, major tourist attractions and destinations through out New Zealand all year round. 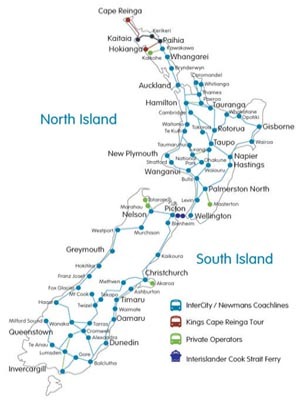 With a range of fares from NZ$1.00, travelling on the North Island bus and coach services of InterCity Coachlines is a great way to see New Zealand's diverse scenic beauty. Travel is on modern eco-friendly, air conditioned coaches and buses featuring reclining seats with foot and head rests, with some long distance coach services having on board washroom/toilet facilities. All regional and long distance bus and coach services do stop regularly for optional refreshment and comfort breaks. InterCity Coachlines operate regular daily regional and long distance bus and coach services from Christchurch to destinations in the South Island, with some regional and long distance bus and coach services connecting with Cook Strait ferry services that operate between Picton in the South Island and Wellington in the North Island. InterCity Coachlines operates the Starlighter overnight coach services between Wellington, Palmerston North, Taupo, Rotorua, Taupo, Hamilton and Auckland connecting at Wellington with Cook Strait ferry services operating between Picton in the South Island and Wellington in the North Island. The Starlighter overnight services features reclining seats with foot and head rests, individual reading lights and air conditioning controls, onboard toilet/washroom facility and makes two refreshment/comfort stops on route. If travelling on a Cook Strait ferry service between Picton and Wellington, using the FareFinder located on the left - type or select 'Picton' in the 'From' field and type or select 'Wellington Central' in the 'To' field as your destination. For travel combined coach and ferry travel from Christchurch to Wellington, Palmerston North, Taupo, Rotorua, Hamilton or Auckland, using the FareFinder - type or select 'Christchurch' in the 'From' field and type or select 'Wellington Central, Palmerston North, Taupo, Rotorua, Hamilton or Auckland Central' in the 'To' field, as your destination. Christchurch International Airport pick up or drop off for Newmans coach services between Christchurch Lake Tekapo, Twizel, Wanaka and Queenstown - select or type 'Christchurch Antarctic Centre' in the 'From' field or the 'To' field as your Christchurch airport pick up or drop off location. Reservations can be made for drop off options at Christchurch International Airport on northbound InterCity bus and coach services from Invercargill, Te Anau, Queenstown, Dunedin, Timaru, Oamaru, Ashburton to Christchurch and Great Sights scenic coach services from Queenstown, Twizel, Lake Tekapo and Mt Cook - by typing or selecting in the FareFinder 'From' field your departure location and 'Christchurch Airport' in the 'To' field, as your drop off location. If you want to explore and see New Zealand's scenic beauty, there are a range of 'Book As You Go' bus and ferry passes, where you can travel at your own pace, in any direction, on the networks of InterCity Coachlines, Newmans Coachlines or Great Sights and Cook Strait ferry services between the North and South Islands, giving you real value for money travel. After a day's travel, there is a range of budget accommodation, backpacker hostels, motels, motor inns, apartment and hotel accommodation including 'Grab A Bed' offering special 'Internet' only prices to choose from.